The Pittsburgh Penguins signed defenseman Christian Ehrhoff to a one-year contract, it was announced today by executive vice president and general manager Jim Rutherford. The deal has an average annual value of $4 million. Ehrhoff, 31, has played the past three seasons with the Buffalo Sabres, tallying six goals, 27 assists and 33 points in 79 games in 2013-14. His assist total led all Sabres players, while his point and time on ice (23:54) totals led all team defensemen. 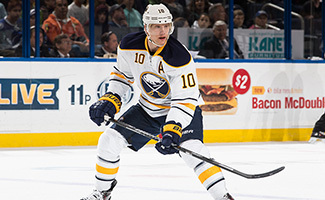 The 6-foot-2, 196-pound Ehrhoff served as an alternate captain for the Sabres. He ranked first on the Sabres in power-play minutes and second in shorthanded minutes in ’13-14. Ehrhoff also placed second on the squad with 119 blocked shots. Ehrhoff, who hails from Moers, Germany, has played 10 NHL seasons with San Jose, Vancouver and Buffalo, registering 69 goals, 244 assists and 313 points. In back-to-back years in 2009-10 and ’10-11, Ehrhoff scored 14 goals each season. Ehrhoff has 34 points (7G-27A) in 73 career playoff contests. Originally drafted by the Sharks in the fourth round (106th overall) of the 2001 NHL Draft, Ehrhoff had his best season with Vancouver in ’10-11, helping the Canucks advance to the Stanley Cup Final. During the regular season he established career highs with 14 goals, 36 assists and 50 points. He added 12 points (2G-10A) in 23 postseason contests. Ehrhoff has proven to be one of the league’s most-durable defenders, appearing in 587 of 622 games (94.4%) the past eight years. Ehrhoff has represented Germany many times internationally, including Olympic appearances in 2002, ’06 and ’10. He was Germany’s captain at the 2013 World Championships, and he was named one of the German’s ‘Top Three Players’ at that tournament. During the 2010 World Championships, Ehrhoff was named to the tournament All-Star Team.